Flipkart is ending up the year 2016 with the last big sale. After Big Diwali Sale and Big Billion Days sale, Flipkart is all gearing up to start the upcoming holiday season. The India’s e-commerce giant Flipkart announced the Big Shopping Days sale from 18th December to 21st December 2016. 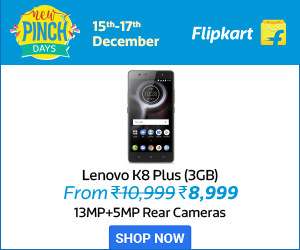 The company is hosting the Flipkart Big Shopping Days where the customers can expect the big discounts on the smartphones, Electronics, TV appliances and many. Flipkart announced that buyers would get 10 percent discount on the shopping during Big Shopping Days Sale on using SBI credit cards. Flipkart also announced the Win-Win Offer and the company claim to give an offer to the user a chance to do shopping for free on the site. In addition to this, the top 10 spenders can win an opportunity to get a couple of holiday trips to Sri Lanka, Europe, Andamans, Himachal Pradesh or Mauritius. Flipkart has announced the sale of OnePlus 3 is under Rs 20,000 under the four-day sale which is still available on Amazon for Rs 27,999. Bu the OnePlus Co-founder Carl Pei has expressed his confusion through Tweet on Friday. If you are a new customer, ensure that you have to fill the registration details and verified your mobile number on the Flipkart ahead of Big Shopping Days sale. Get ready for the Flipkart Big Shopping Days offer from midnight.